All Line sets include copper lines with both liquid and suction lines insulated with rubber. Each set is equipped with flare nuts on both ends. They are convenient, inexpensive and they contain everything you need for quick and easy installation. 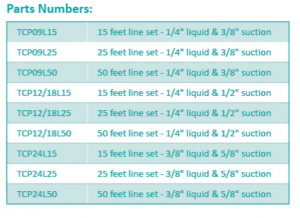 Line sets are available in 15ft, 25ft and 50ft lengths.